With the release of the second generation of Zune devices, another party is in order. I attended the first shindig for the launch of the initial media player back in January of this year. Bun B made an appearance as Ab Liva and the Clipse took the stage. The show was packed full of that snow white rap as the cool kids on the floor rapped word for word. 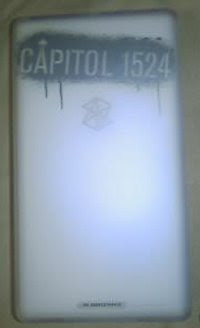 That first show was celebrating the collaboration between Capitol 1524 and Zune on a limited edition version as seen below. 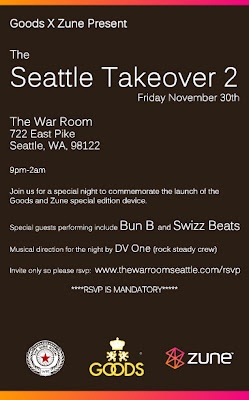 This second effort between Zune and another Seattle boutique, Goods, will be celebrated at The War Room on Friday, November 30th. Bun B will be back, perhaps he'll perform this time, alongside Swizz Beatz. A FREE show you can't beat (pause), other than yourself (and pause), if you don't remember to RSVP! Click here to get on the list. It's showtime snitches!